Wayne Rich's HARMONIC '67 classic noserider. Deep Merlot Red tint with an abstract acid wash topcoat at the nose in a gloss & polish finish. Double 3/8" stringers with black gluelines separated by a 1 1/8" foam core. Black & white WR logo on top. Volan forward-swept chevron deck knee patch and nosecone fin patch. Signed by Wayne with lots of hand drawn Waynoglyphics. 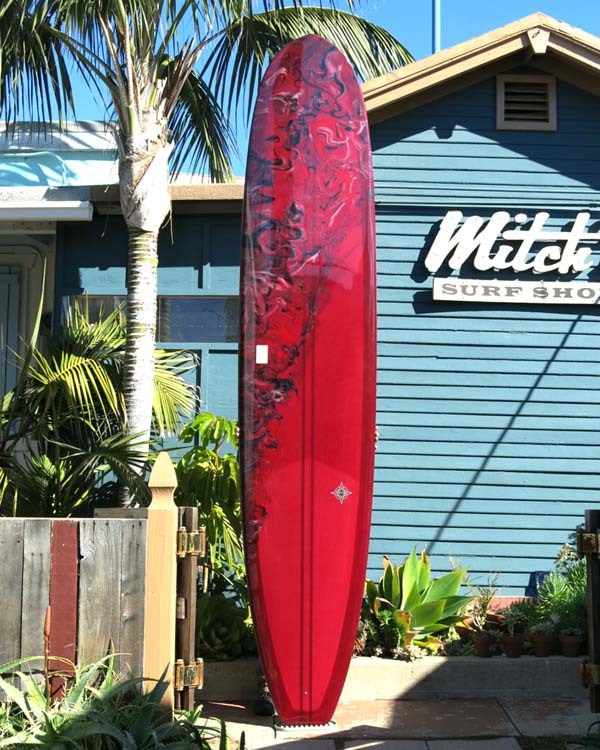 Single center fin box; comes with the WR Harmonic fin. Length: 9' 8" Width: 23 1/2" Thick: 3 1/4"
Nose: 18 7/8" Tail: 15 3/4"
Wayne Rich's HARMONIC '67 ultra-classic California noserider. Volan glassing, 50/50 rails with a long deep dish concave and plenty of tail rocker. Single fin setup. Rare, handmade, extremely well shaped & finished noserider with custom details. Hand shaped & glassed polyurethane foam.